Scary! Tomorrow is Halloween. Will you be choosing the trick? Or the treat? Life is such a treat – yet sometimes we choose the trick. We choose to trick ourselves into allowing the circumstances of our lives harden us so that we become increasingly resentful and afraid instead of letting them soften us and make us kinder and more open to what is scary. Ah, Halloween! Ghosts, goblins, spiders, haunted houses. It’s a strange holiday, isn’t it? Every culture has its celebrations, festivals, holidays, but modern Halloween in the United States is just bizarre – celebrating, as it does, a roughly equal mix of fear and chocolate. Frankenstein, Dracula, and The Mummy! Dressing in costume and going door-to-door begging! The day of the dead! Samhain! The evening before all saints’ day, or all hallows’ day. Through the accidents of history, a lot of very different things are all cobbled together and called “Halloween.” If there is a center, it’s: Being Scary. For the children, it may be a way for helping them cope with their fears. By dressing up as something that scares them, they move toward accepting their own fears. Dress up as a monster, get a bag of candy, and monsters aren’t so frightening anymore. It works for children. Maybe it would work for us, too. What is that you’re afraid of? What bogeymen haunt your dreams? Maybe it would help grown-ups to dress up as the things that we are scared of. We worry about our health. We worry about our finances. Disease, and running out of money take the place of zombies and werewolves as the things that scare us. It might seem self-indulgent, or in bad taste, or insensitive, maybe, to dress up as a cancer cell, put on the costume of a osteoporotic bone. Or maybe we could dress up as a bank statement with a zero balance. If we had a costume party and dressed up as the things that scare us, it would not make the fears go away – but it might help the fear weigh a little more lightly. Or maybe we could go door to door dressed up as the thing that most scares us, and instead of candy, at each house, have a little wine. What we can bring right out in the open and laugh about we can live with more comfortably, don’t you think? Go to the places that scare you – that’s kind of what children do at Halloween, dressing up in scary costumes. They’re plunging into the places that frighten. So maybe us adults should try it. Maybe the thing that scares us most is loss. How could there be a costume for that? Loss has touched each of us – and it was no fun – and we are afraid of losses to come. We have lost, and will lose again. Living means losing. Out of our very loss, we are able to turn to each other, reach out, take hands and enter into covenantal relation of community. And how much we need and can help one another. "This is a place for losers!" So "Let’s see who we are And how we are. And how much we need and can help one another." From the very loss we fear emerges the community we need. Paving the way for success is not the point of failure, any more than paving the way for failure is the point of success. The point of failure is to set you free. Its message, if we will but hear it, is that what you are is enough. You don’t need more. As the losses come: hair, memory, health – at each step, what we are left with is somehow also enough. Yet fear constricts our lives, shuts out the beauty that is all around us right now by filling our consciousness with a future in which we’ve lost something we cling to, or have gained something we really didn’t want. More precisely, it isn't fear that constricts our lives, it is we ourselves who do that in an attempt to make the fear go away. "If I stay within my protected cocoon, then I won't experience fear," we think. The genius of Halloween is its encouragement to go toward our fear rather than pull back from it -- for the pulling back is what constricts our lives. When we simply experience fear just as it is -- without wanting it to go away, without fighting it, without the judgments and opinions and reactions that we throw up to protect ourselves from it -- then fear isn't nearly so frightening. Let’s look again to the children. The lessons we try to impart to them, are the lessons we still need. You remember Robert Fulghum’s 1988 book: All I Really Need to Know I learned in Kindergarten? It’s so true. Be kind. Say please and thank you. Remember to flush. The seed in the paper cup – the shoot goes up and the roots go down. Hold hands when you cross the street. Stick together. Take naps. Play some and work some everyday. Share your toys. As grown-ups, we so often forget the very lessons that we teach our children. So let me share with you a children’s story about fear. Let’s remember together the lessons simple enough for children. Scaredy Squirrel, by Melanie Watt. Scaredy Squirrel never leaves his nut tree. He’d rather stay in his safe and familiar tree than risk venturing out into the unknown. The unknown can be a scary place for a squirrel. A few things Scaredy Squirrel is afraid of: Tarantulas. Poison Ivy. Green martians. Killer bees. Germs. Sharks. So he’s perfectly happy to stay right where he is. Advantages of never leaving the nut tree: Great view. Plenty of nuts. Safe place. No tarantulas, poison ivy, green martians, killer bees, germs, or sharks. Disadvantages of never leaving the nut tree: Same old view. Same old nuts. Same old place. In Scaredy Squirrel's nut tree, every day is the same. Everything is predictable. All is under control. But let’s just say, for example, that something unexpected did happen. You can rest assured that this squirrel is prepared. 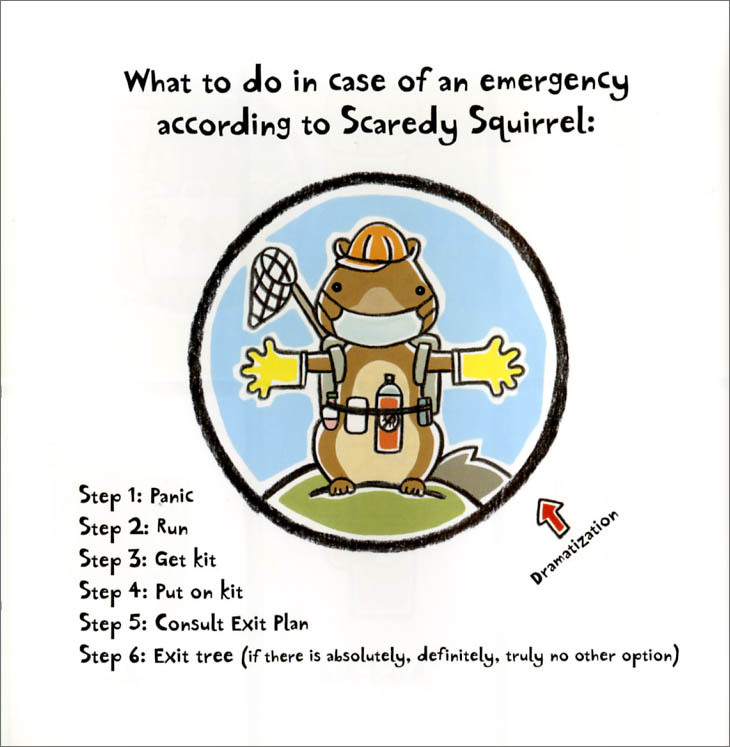 A few items in Scaredy Squirrel’s emergency kit: Parachute. Bug spray. Mask and rubber gloves. Hard hat. Antibacterial soap. Calamine lotion. Net. Band aid. Sardines. Step 4: Put on kit. Step 5: Consult exit plan. Step 6: Exit tree (if there is absolutely, definitely, truly no other option). Exit 1: Parachute. Note to self: Watch out for green martians and killer bees in the sky. Exit 2: Note to self: Do not land in river. If unavoidable, use sardines to distract sharks. Exit 3: Note to self: Look out for poison ivy and for tarantulas roaming the ground. Exit 4: Note to self: Keep in mind that germs are everywhere. Remember: If all else fails, playing dead is always a good option. With his emergency kit in hand, Scaredy Squirrel watches. Day after day, he watches, until one day… Thursday. 9:37am. A killer bee appears. Scaredy Squirrel jumps in panic, knocking the emergency kit out of the tree. This was NOT part of the plan. Scaredy Squirrel jumps to catch his kit. He quickly regrets this idea. The parachute is in the kit. But something incredible happens. He starts to glide. Scaredy Squirrel is a flying squirrel. Scaredy Squirrel forgets all about the killer bee, not to mention the tarantulas, poison ivy, green martians, germs, and sharks. He feels overjoyed, adventurous, carefree, alive. Until he lands in a bush, and plays dead. 30 minutes, 1 hour, two hours. Finally, Scaredy Squirrel realizes that nothing horrible is happening in the unknown today. So he returns to his nut tree. All this excitement has inspired Scaredy Squirrel to make drastic changes to his life. Scaredy Squirrel new and improved daily routine. 9:37am Jump into the unknown. That's a helpful story for kids -- and for grown-ups. All we really need to know, we learned as kids -- or we could have learned, had we had stories like Scaredy Squirrel. "Scaredy Squirrel never leaves his nut tree. He’d rather stay in his safe and familiar tree than risk venturing out into the unknown." The unknown is filled with scary things. Maybe the fears of your life lately have not included tarantulas, poison ivy, green martians, killer bees, germs, or sharks. Whatever it is, the fear, or your attempt to avoid fear, keeps you from life. What do children learn from the Scaredy Squirrel story? One. Plans are silly. The glory of life is most present when we stop pretending to be in control, stop trying to control everything, jump into the unknown. That’s what faith is about. Faith is not about believing without evidence. Faith is the act of opening our hearts to the unknown. Faith is about taking that leap. So faith is the antidote of fear. Two: Fearlessness is our unfinished project. Scaredy squirrel has learned to jump into the unknown. At exactly 9:37am. And then he plays dead for two hours. He has let some of his fear fall away, but he is not yet living in each moment, present to what is there without trying to control it, creatively open to engaging in joy with what’s there, whether it be killer bees, poison ivy, or green martians. Scaredy squirrel has more work to do. I know. Because I'm Scaredy Squirrel. And I know I have more work to do. I can tell myself: live life as an experiment. Inquisitive. Open. Curious about everything. Flexible. But telling myself that reminder quickly fades. It takes doing the work to build the habit of openness into our lives. What’s scary is THE UNKNOWN. Learning more about whatever you are afraid of can help, but that’s not real liberation. Real liberation is in our attitude to the unknown. Liberation comes from having a heart of faith -- that is, a heart that is ready to open to the unknown. 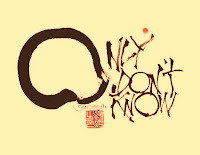 The Zen monastic, Fayan, lived from 885 to 958. He studied under Dizang. After a number of years with Dizang, one day Fayan went to tell Dizang that he was leaving. “Where are you going?” asked Dizang. “Around on pilgrimage,” said Fayan. “What is the purpose of pilgrimage,” said Dizang. Intimacy. Leaping into the unknown might help you learn some things about that world out there that had previously been unknown. You don’t know: go out and learn. Sure, that’s valuable. That’s great. It is not, however, the intimacy that Dizang was talking about. It’s not about, "go get one more bit of knowledge and add it to the stockpile so as to diminish the realm of unknown." It’s about bringing an openness to every moment. Every moment is filled with the unknown – even when all we do is cower in our nut tree. In fact, knowing about something can get in the way of learning about it. Oh, that’s a pine tree. I know about pine trees. Evergreen. Pine needles. Flaky bark. And then you’re not open to what that particular experience of a pine tree might offer. 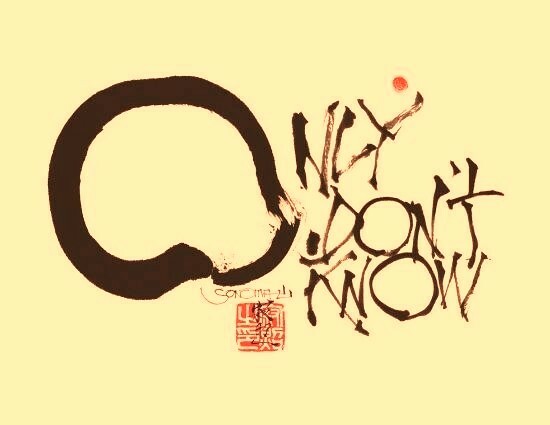 There’s a saying, attributed to Lao Tzu, the founder of Daoism. "For knowledge, add. For wisdom, subtract." To grow truly wise is an ongoing project of paring away your conceptions, peeling back what you’ve learned before, so as to more closely – more intimately – approach what’s right here now. Not knowing is most intimate. In the space of not knowing is the liberation. Loss and sadness come – and we can take them in as one more experience of life. And I think each of us have known people who made each of those choices. I think you know people who experienced a deep loss or failure, and it hardened them. They became the disillusioned cynic. Nothing in life was ever again beautiful or good enough for them. If you are lucky, you have also known people who were able to go the other way – like my friend I'll call "Clare" [Mentioned in previous post, "The Upsides and Downsides of Spirituality."] Clare had one daughter, Zoe, a love of her life and shining light of her heart. Zoe grew up, went away to college. Clare and Zoe remained close, spoke often by phone. Zoe was 20, still in college, living in an apartment, when an intruder broke in and murdered her. Clare felt that loss as deeply as a human heart can feel. She lost her child! She wept, wailed, and cried curses to the heavens. She also knew how to do her work. She knew how to go to the places that scare. She understood grieving, and was able to be with her feelings instead of wanting to push them away. There was no denying that rebuilding a life of meaning and hope for Clare was hard and slow work that, at some level will never end, yet Clare had a deliberate plan for doing that work – various spiritual practices. I first met Clare two years after the tragedy. I know her as a woman of remarkable joy, a ready laugh, and a lovely friend. Thank you for posting your sermon today. I loved it! I wanted to share it with my husband.